Gillbryan Mrs Macnamarra has gained her Studbooknumber at her first show out after her litter! Hello. We are Gilly and Brian Wicklow and we are Gillbryan Golden Retrievers. 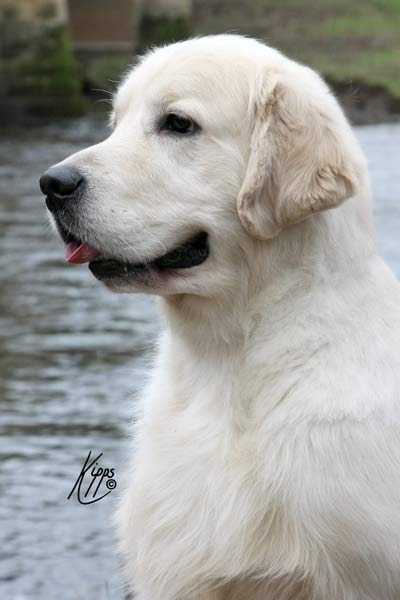 We hope you find our website useful and interesting and to start off let me tell you a little more about us and where the world of Golden Retrievers has taken us..
My interest with dogs and the show ring started as a child. I recall saving any spare pennies I had for the bus fare to the nearest dog show and sneaking under barriers at Balmoral Showground in Belfast to watch the judging. Our first Golden Retriever joined us in 1980 and as one soon became five it quickly became apparent that our suburban semi detatched to the south of Cambridge wasn’t exactly ideal. We eventually found a remote property out on the fens in East Anglia where we lived in a mobile home whilst accommodation was built for the dogs and basics like water, electricity, gas and drainage were sorted out in the main house. And it was here that we also built and ran successful boarding kennels for 5 years, until Brian’s job meant a relocation to Lichfield in Staffordshire. After a few years away from the show ring, we went back to our bloodline with Brensham Kerfuffle from Mary Woods and Lorinford Fanny Adams from Monica Everett-Monks to get us back into the ring again but fate had other ideas, and redundancy pushed us to relocate again. It was Wiltshire this time, where our show ring success went from strength to strength and in partnership with Marilyne and Derek Lade we had our first Show Champion Gillbryan Partner in Crime at Mantondean. It was here we also fell back on our previous boarding kennel success and over a period of some 10 years, built up a very successful business. 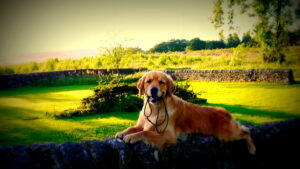 July 2005 saw another turn around of events and we found ourselves looking at an ideal property in a very rural location in The Borders not so far from Carlisle. That’s where you’ll now find us and all our dogs, on the outskirts of the forest amongst deer, birds of prey and red squirrels. Well we were until the Forestry Commission did a lot of felling! But the views are now superb. You’ll usually find us at most of the big shows campaigning our adult dogs and bringing on pups too. Our current star is Joseph (Sh. Ch.Gillbryan Any Dream Will Do JW, 3 CC’s, 4 Res CC’s) who’s turning heads in the show ring, as are his progeny. And if we’re not showing, you’ll often find Gilly judging which recently meant a trip down under where she was invited to judge at the Golden Retriever Clubs of Victoria and Perth, then on to the Southern Golden Retriever Club in New Zealand. Gillbryan is international too, our dogs can be found across Europe and sometimes further afield, not only as pets but in the showring too. 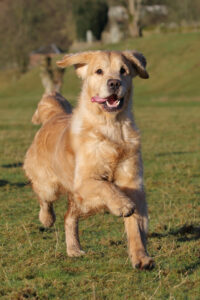 As I’m sure you’ve gathered, Golden Retrievers are our life, from when we wake up to bedtime, and regularly inbetween too! 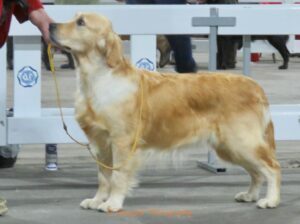 Gillbryan Golden’s are bred to be wonderful family dogs, to be strong healthy and conform to the breed standard set by the Kennel Club. 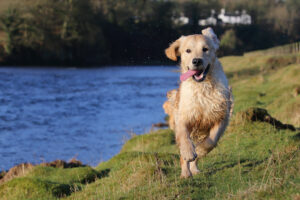 All our dogs have complete and up to date health checks including hip scores and eye checks. We occasionally have puppies for sale to good, loving, vetted homes and owners and happy to speak to those people who would like to know more.